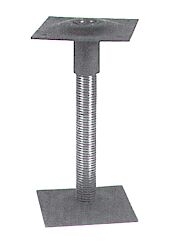 Replacement mechanism for most swivel-type piano stools. Closed height at lowest 4" and opens up to 8"
O.D. of threaded tube is 1-1/4"
Service was prompt and thorough. I would recommend this shop to anyone. Vandaking employees great. Your parts are good. Fast and the right parts I needed. Thanks.